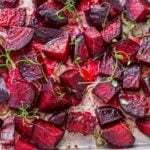 Oven roasted beets are incredibly easy to prepare and the whole family will love them! This simple recipe takes bland to delicious and everyone is a beet lover after they try it! Wash beets and trim long leaves to about 1 inch above the beetroot, if necessary. Wrap the beets individually in foil. If the beets are very large, slice them in half and wrap the halves individually in foil. Bake until fork tender, this takes about 45 minutes for medium-sized beets. Let cool so you can handle them, or put them in an ice bath (see note) to cool more quickly. Once beets are cool enough to handle, rub the skin with a paper towel and it will come right off. Trim the tops and bottoms and cut into bite-sized pieces. Bake an additional 10 minutes to heat through, or serve room temperature. An ice bath is a bowl filled with ice water.